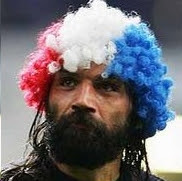 Tongan rugby officials expressed dismay today at the news that the IRB had allowed French hard man Sebastian Chabal to dye his hair red, white and blue for tomorrow's le crunch semi-final against England. The IRB had previously banned the Tongan team from dyeing their hair green before their crucial group game with England last month. "It's a classic case double standards," said a Tongan spokesman. "As usual it's one rule for the big boys and another for the minnows." 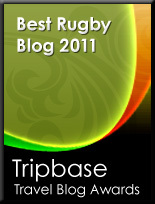 The IRB issued a statement late last night to confirm their decision. "Although at first we felt that it was inappropriate for Monsieur Chabal to dye his hair in this manner, after a personal hearing in which the player threatened to rip out our intestines and feed them to his hamster, we believe it is now in the interests of the game that he be allowed to do whatever he wants," the statement read. When contacted about this matter, Chabal is reported to have said: "Grrrr nngghh ungg grrr."